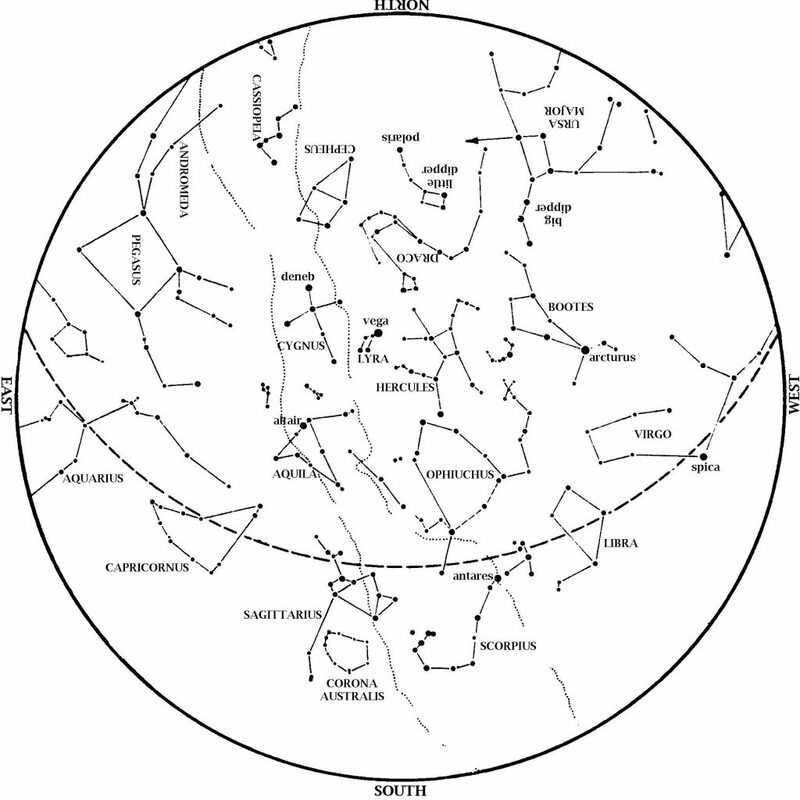 This star map shows the Houston sky at 10 pm CDT on August 1, 9 pm CDT on August 15, and dusk on August 31. To use the map, put the direction you are facing at the bottom. The Summer Triangle is high overhead. This consists of the brightest stars in Cygnus, Lyra, and Aquila. Scorpius, the Scorpion, is in the south, with the ‘teapot’ of Sagittarius to his left. From the Big Dipper’s handle, ‘arc to Arcturus’ and ‘speed on to Spica’ in the southwest. Mars begins to pass under Saturn in the south at dusk. The Great Square of Pegasus rises in the east, heralding the coming autumn. Jupiter is low in the west at dusk; this is the last month to see it in the evening sky until March 2017. It outshines all stars we ever see at night, so you can’t miss it even as it sets in twilight. Venus begins to re-emerge into the evening sky this month. How soon can you spot it low in the evening twilight? Towards the end of the month, watch Venus approach Jupiter; they are only 0.07 degrees apart on August 27. On that night you must observe right after sunset to catch that pair, as they set before twilight ends. Mars and Saturn are now in the south southwest at dusk. Mars continues to fade each night as Earth leaves it farther and farther behind. Also, it moves faster than Saturn against the background stars, so you can watch Mars overtake Saturn this month. Today, Mars is to the right and is much brighter. By August 23-24, however, Mars will pass between Saturn and the bright star under it, Antares in Scorpius. By the end of the month, Mars is to the left of Saturn. The Big Dipper is above the North Star, with its handle pointing up. From that handle, you can ‘arc to Arcturus’ and then ‘speed on to Spica’; those stars are in the west at dusk. Antares, brightest star of Scorpius, the Scorpion, is in the south, with the ‘teapot’ of Sagittarius to its left. Saturn is right above Antares. The Summer Triangle is almost overhead. The stars of summer are here. Meanwhile, the Great Square of Pegasus rises in the east at dusk, and is fully risen by month’s end. Autumn is on the way. New Aug. 2, 3:45 p.m.
1st Quarter Aug. 10, 1:21 p.m.
Full Aug. 18, 4:27 a.m.
Last Quarter Aug. 24, 10:41 p.m.
As of Jul 19, 2016, Brazos Bend State Park is all dried out from the floods of April and May and back open to the public. Come see us Saturday nights at the George Observatory! On most clear Saturday nights at the George Observatory, you can hear me do live star tours on the observation deck with a green laser pointer.